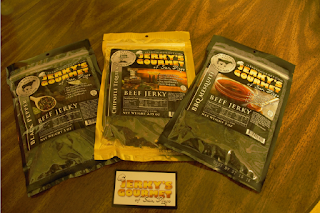 Lil' Blog and More: Jerky's Gourmet Beef Jerky Review! I love beef jerky! It is so delicious. And while being pregnant, it has really sucked, not being able to indulge (there's actually so much you can't have when your pregnant - And I swear, all the stuff that I can't have, is the stuff I'm craving..Lol) However, beef jerky is something that I can have in small moderation - So even though, I wasn't able to pig out on this, I was able to try a small piece of each flavor. I contacted Jerky's Gourmet, and he agreed to let me choose 3 different flavors to try out. It was hard to pick, with so many great flavor options, but we ended up going with Chipotle Tequila, Black Pepper, and Barbecue Mesquite. I personally, love the Black Pepper. I've always been a fan of peppered jerky - It just has so much flavor, and it's not really spicy. It's just that when you put it in your mouth, you can just taste all the wonderful flakes of peppercorn, mixed in with the delicious beef. Luke liked the Barbecue Mesquite. Don't get me wrong - I liked it too! 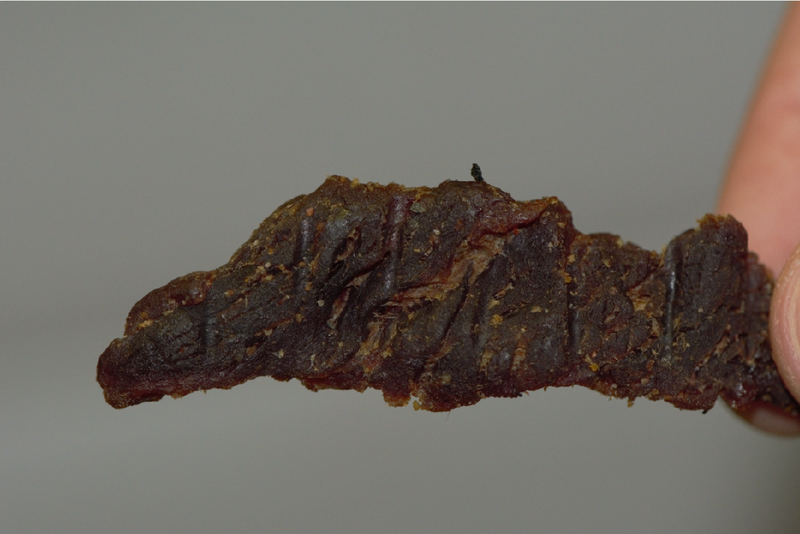 What made this jerky so good, was that it actually had the barbecue on it, and it made the jerky a little extra soft, which we love! Plus you just get extra flavor. And we liked the Chipotle Tequila, too. This one had a little bit of heat too it - But it's strange (a good strange) because it also has a sweetness to it. It starts sweet, and finishes with heat. As you can see from my pictures, all of the jerky is just loaded with flavor and spices. And the good part about Jerky's Gourmet, is that, all of there jerky is made from grass-fed beef, which just makes it a higher quality, with a better end result. Overall, we loved our jerky, and would love to try additional flavors in the future! Disclosure: I received free product, in exchange for this review. All opinions expressed within this post are my own, and were not influenced in any way. 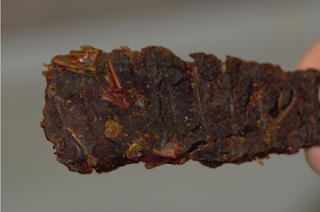 What a great review of this gourmet beef jerky! I don't think I have ever tasted before, so I might have to put that on my list to do! I love beef jerky! Sometimes I see in our stores here in Manila the more exotic meat from game animals like deer and also from other Asian countries, which are cured differently but taste yummy too! I have never tried beef jerky !!! It looks so good in your pictures. I like spicy food so I think I will have to go buy some and give it a try ! My husband loves his jerky! He loves the peppered kind. I usually try to buy him some around the holidays, his birthday, father's day things like that and I put it in a basket full of all the things he loves. It makes a great gift basket stuffer. Great review and those pictures really do show the spices in each piece. They all sound so good. I love beef jerky!! None of my kids like it so its something I can pick up for me and enjoy! I have not heard of this brand before! Thanks for the review. Those beef jerkies look so yummy I would want to run out and get some for myself. Beef Jerky is my husband's favorite snack. I don't think that he has tried this brand, though. I will check this out. I tried beef jerky before and I did like and then second time I didnt so I am not sure about them. 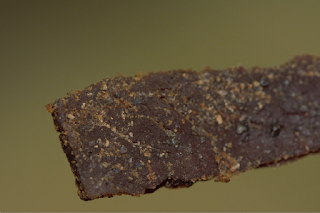 This sounds delicious - we love jerkey but it's kind of pricey so we generally get it when we take a road trip - it's the perfect road trip treat! I've never tried this beef, looks really fantastic. I'm curious now what taste this. Awesome review. Very detailed and very true. Love this product by the way. I did not know that you could not have jerky when you were pregnant. The Chipotle Tequila flavor is definitely something I would want to try. Great review! My husband and son are huge beef jerky fans and love trying new brands. I love a good jerky and I eat it as movie food! Will look for this brand! My sons would love all these different types of,jerky and I am glad that they are made form grass fed beef. I used to love jerky but I haven't eaten any in a long time. Now I want to try it again! This sounds like something Chris would love, thank you for sharing your review. I love beef jerky but I can never find any that I truly enjoy so I would like to try this! Ooh we love beef jerky here too!! I didn't know you can't have it while prego! Whoops!! Lol!! The tequila lime sounds right up my alley! I love jerky! I hadn't heard of this brand, so I'll have to look for it! The Peppered sounds good to me! I love beef jerky, too. Protein in a snack with yummy flavors. I haven't tried gourmet before, but it sounds great.